There are airlines that connect Manokwari city with towns in West Papua as well as with big cities in Indonesia. From Jakarta, Denpasar, Surabaya, Makassar and Manado, visitors can fly in jet planes to Manokwari. Batik Air operates Airbus A320 for direct flights between Jakarta and Manokwari. Garuda flies her passengers by Boeing 737 to Makassar city as its transit point. After that the flights to Manokwari are continued by Bombardier regional jet CRJ 1000. Sriwijaya also provides flights to Manokwari using their Boeing 737. Most of the flights from Makassar to Sorong and then to Manokwari occur at nights. The planes land in this city in the mornings. 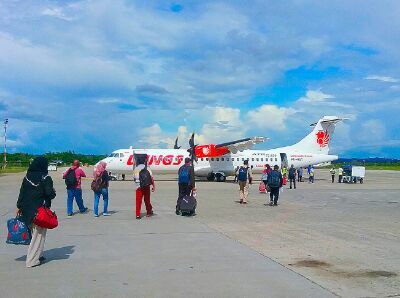 Flights from Kaimana, Fakfak, Ambon and Sorong to Manokwari are provided by Wings Air using their turboprop aircraft ATR 72-600. Usually passengers board the plane at 15.05 in the afternoon and fly along the north coast of the bird's head region of West Papua and arrives in Manokwari city around 16.20 local time. The capacity of this turboprop passenger aircraft is 74 to 78 people. 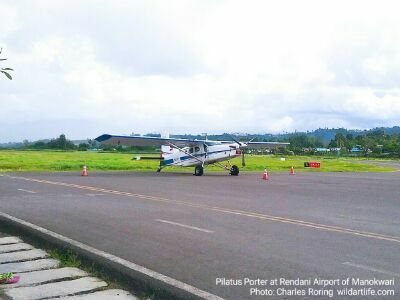 Small district towns and villages such as Numfor, Wasior, Kebar and Merdei are connected with Manokwari city by Susi Air, AMA and MAF. Susi Air operates Cessna Caravan 208 whereas AMA mostly flies PC-6 Pilatus Porter. This light and small aircraft can land on grass land and other unprepared or rough airstrips. Manokwari is the capital of Papua Barat province of Indonesia. It is also a recommended destination for birdwatchers who want to explore the rainforest of West Papua to see such birds as Lesser Birds of Paradise, King Bird of Paradise, Magnificent Riflebird, Western-crowned Pigeon, Sulphur-crested Cockatoo, Azure Kingfisher, Pinon Imperial Pigeon, Rufous-bellied Kookaburra, Yellow-faced Myna, Golden Myna, and etc. In addition to birding, Manokwari has been chosen as the starting point for scuba divers who want to take liveaboard boat tours to Cendrawasih bay. They will dive in the waters around Mansinam island to see shipwrecks and then continue their trips to Cendrawasih bay to see whalesharks and pristine marine lifes.